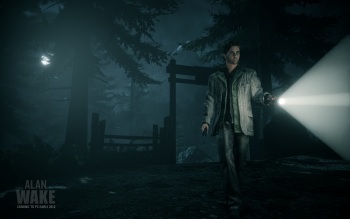 The PC version of Alan Wake recovered its complete development and marketing budget in just 48 hours. Things are looking good for the PC version of Alan Wake, which finally turned up on Steam a few days ago. Despite the game being around on the Xbox 360 for the past couple of years, PC gamers leaped at the chance to play it on their platform of choice, dragging the game to the top of the Steam charts and, more importantly, into profitability in just two days. "We are very happy with the sales and hitting #1 on Steam at launch was nothing short of amazing," Remedy Executive Vice President Aki JÃ¤rvilehto wrote on the Alan Wake forums. "We recouped our development and marketing expenses during the first 48 hours. And yes, we're certainly very excited about PC." The cost of bringing the game to the PC was naturally less than that of the original development for the Xbox 360 but still far from inconsequential. It took a team of eight nearly five months to complete the job, which included improvements to the visuals, interface, and getting everything to "feel right in the PC environment," and the work is ongoing. "We are closely monitoring, following, and are in dialogue in our forums as well as the Steam forums to see any problems people might be having," said Oskari HÃ¤kkinen, Remedy's head of franchise development. "Whilst the reception has been wonderful and there are no known major issues, we are already responding to some wanted requests and working on our first title update." It's exciting to see things going well for the PC version of the game, but HÃ¤kkinen cautioned that it doesn't necessarily signal a sea of change at Remedy. "With this project we got the blessing from Microsoft to go ahead and create the PC experience and we of course jumped at that opportunity - it felt like it was kind of our promise to the PC gamers," he said. "Really, it was more of a decision from the heart than a commercial one but of course it's nice to see it doing well." Alan Wake is available now on Steam, while a retail collector's edition is scheduled to come out on March 2.